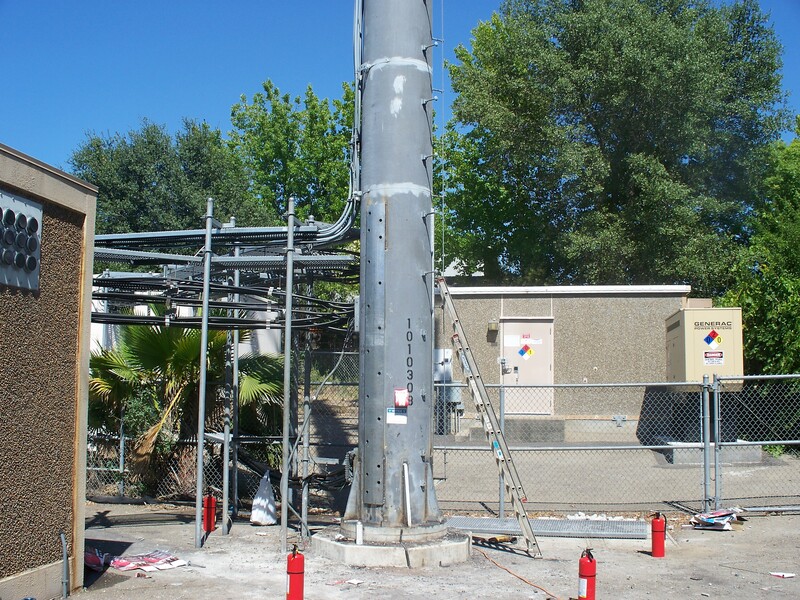 I received a call I was hoping to receive, this company needed a certified welder to modify a cell tower here in Fair Oaks, CA. I believe this is a great fit for my company and am hoping to be able to take care of all the cell tower modifications for this company. 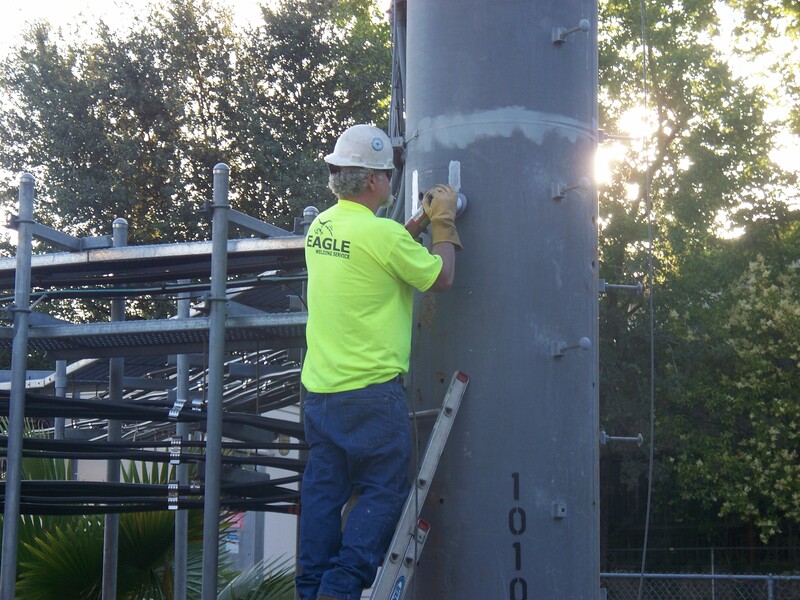 There are several critical elements to modifying a Cell Tower. Safety is of utmost concern. The threat that fire is to the cables is always in the front of our mind. It is critical there be a fire watch and we had to provide a 500 gallon water trailer on site. 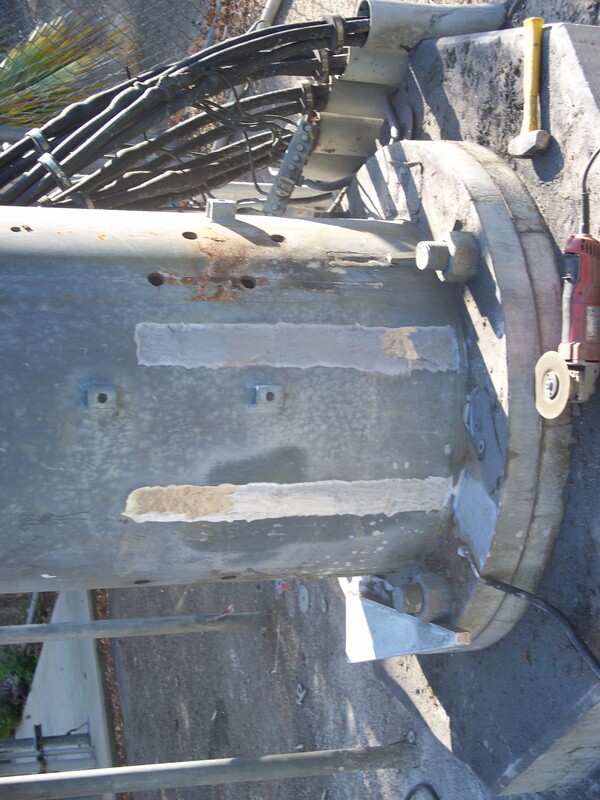 Next the galvanizing must be removed at every weld location. 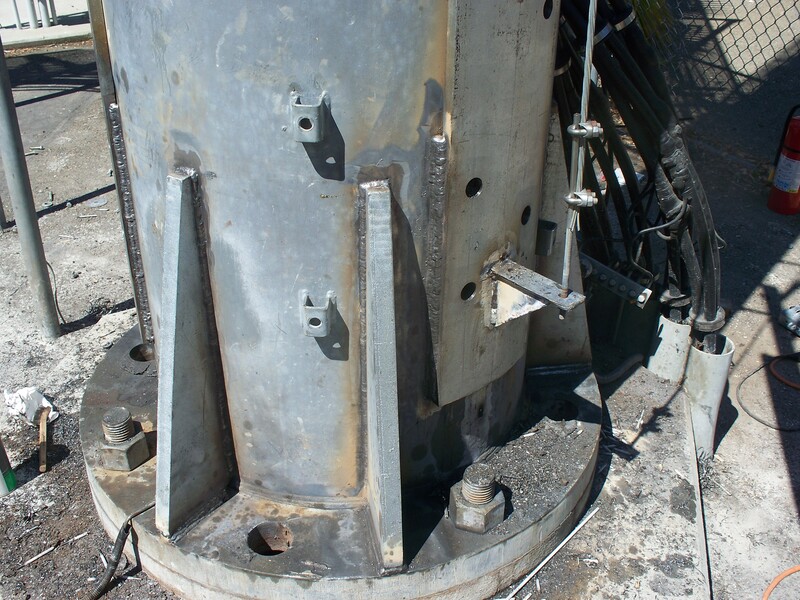 The galvanizing on this pole was approximately 1/16″ thick. 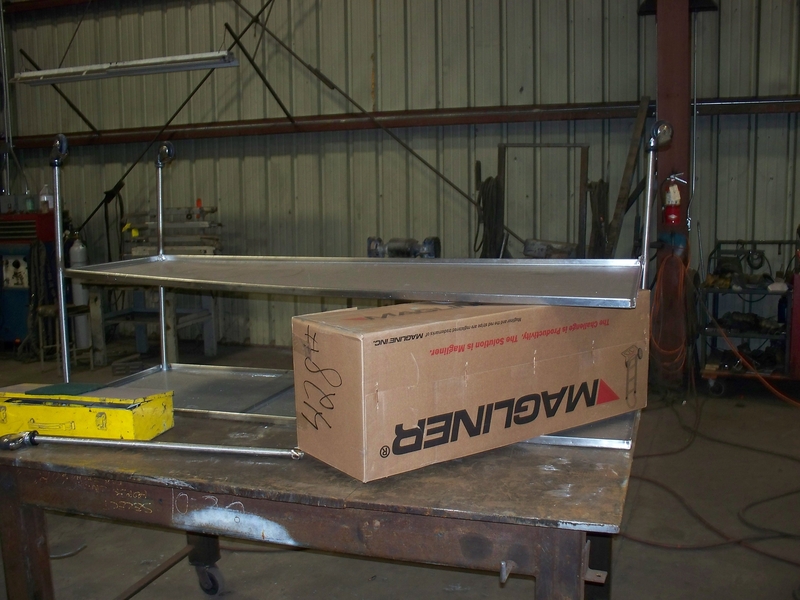 We had to grind approximately 400 lineal inches by 2″ wide on this pole for the plates that needed to be welded on. 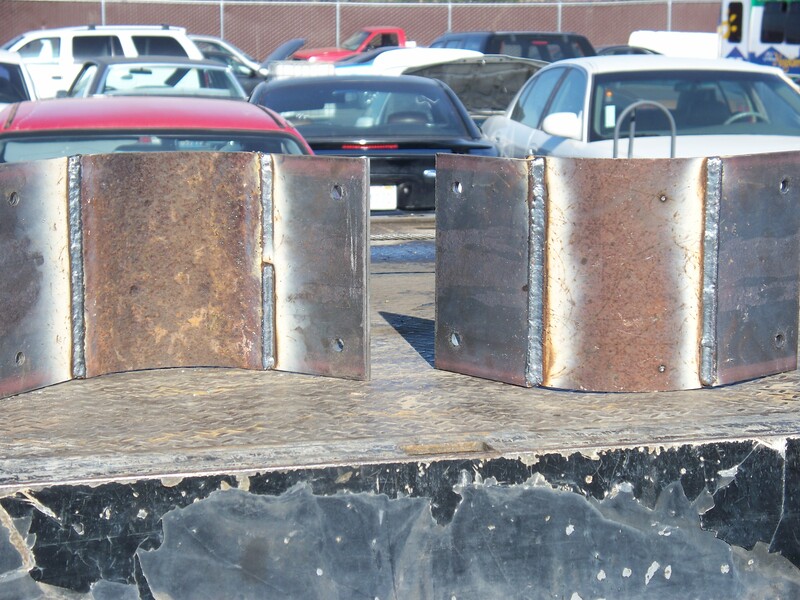 Two of the six gussets we welded on. The vertical plate shown here with the holes in it is typical of 3 plates on this pole. They are 10′ tall by 9″ wide. 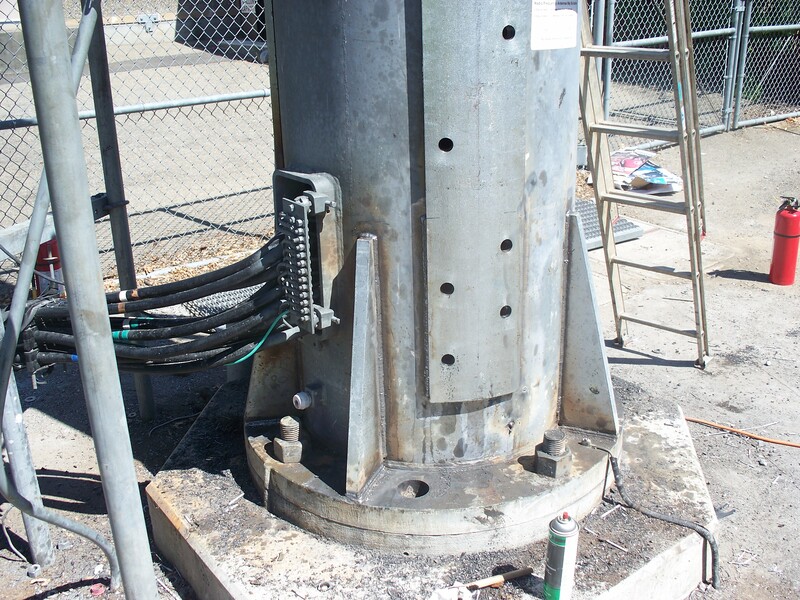 We drilled 17 1-1/4″ holes in each then mounted them and drilled thru the tower at each location. Also you can see how close the cables are to the weld locations. Four of the six fire extinguishers required to be on site. I was called out to Amtrak here in Sacramento, CA to modify luggage enclosure gate so folks could not reach through or around to open the door. I used 1/2″ x #13 flat expanded metal for the screen and 1/4″ round bar on the top of the screen so there is a smooth surface on top of the screen. The gate on the right is a rolling gate and the one on the left is a man gate. We have been out to the Amtrak station several times to modify things and they have always been nice and good to work with. This modification is similar to those we have done on pool gates for Apartment complexes, Hotels, and Motels. This project was off Eight Mile Road in Stockton. Mark from Blue Iron, Inc., www.blueironinc.com, called and asked that I repair the cracks, there were several. I used an air arc, or arc gouging process to clean out the crack. 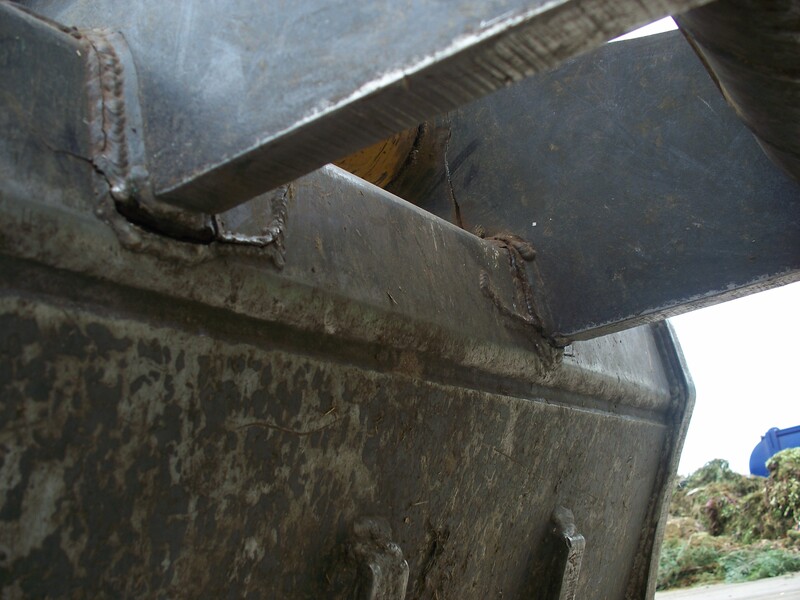 Sometimes the crack does not go all the way through the material and it is imperitive the crack is removed from the material or gouged out then welded up completely. 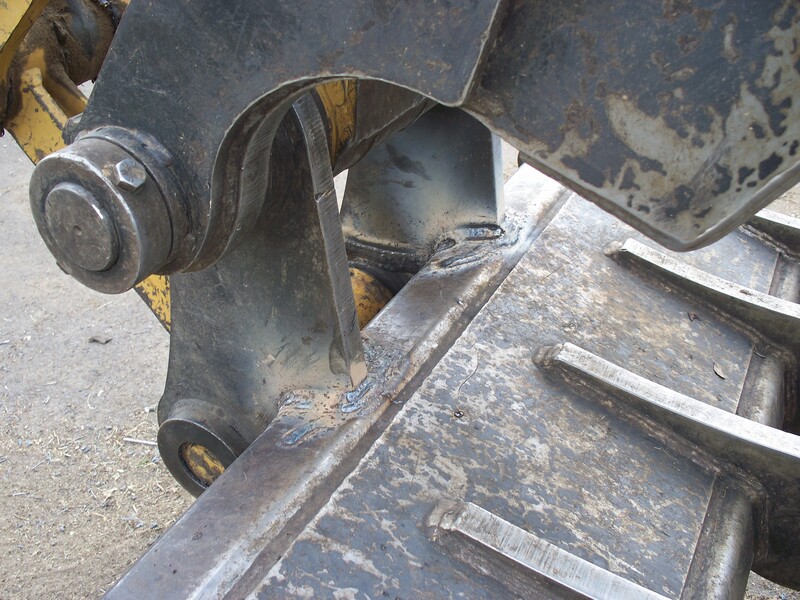 Some welders like to use the Stick welding process , SMAW, to weld these cracks up typically a rod with the 7018 designation. 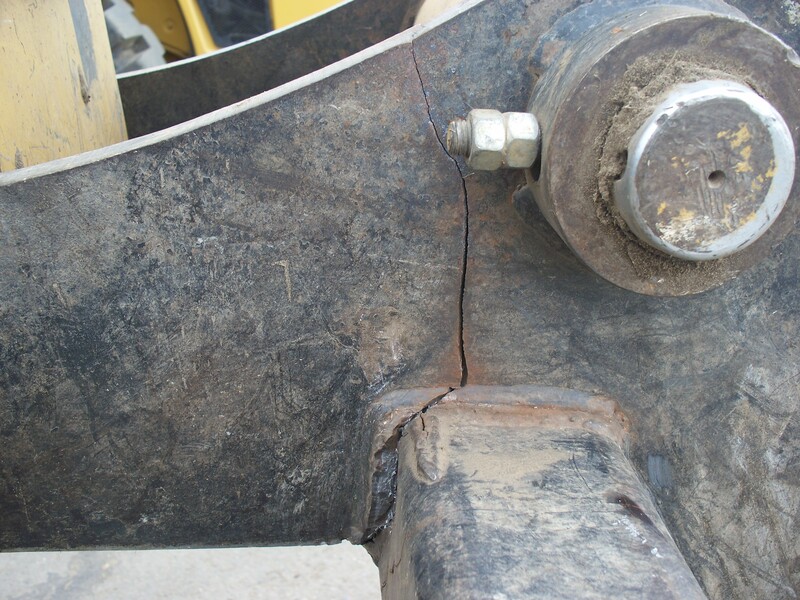 This process is adequite, it provides a strong weld and when done properly the crack should not come back. However it has one down fall and in my opinion only one, its speed. I was able to utilize the wire welding process, FCAW, I used NR 232. Another view of cracks welded up. There were a total of 12 seperate cracks with a total of about 55 – 60 lineal inches combined. This project was completed 2 – 3 hours faster because I used the FCAW process instead of the SMAW process. 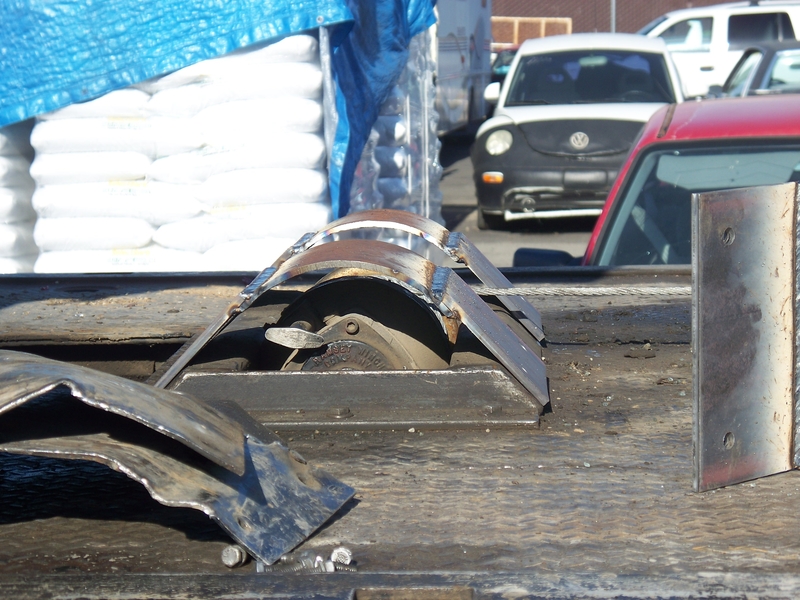 I fabricated these wench drum protectors to replace the ones from the factory as they were too flimsy and continued to get dammaged due to the use of this towing truck. The original protectors are the bent pieces of metal to the right. 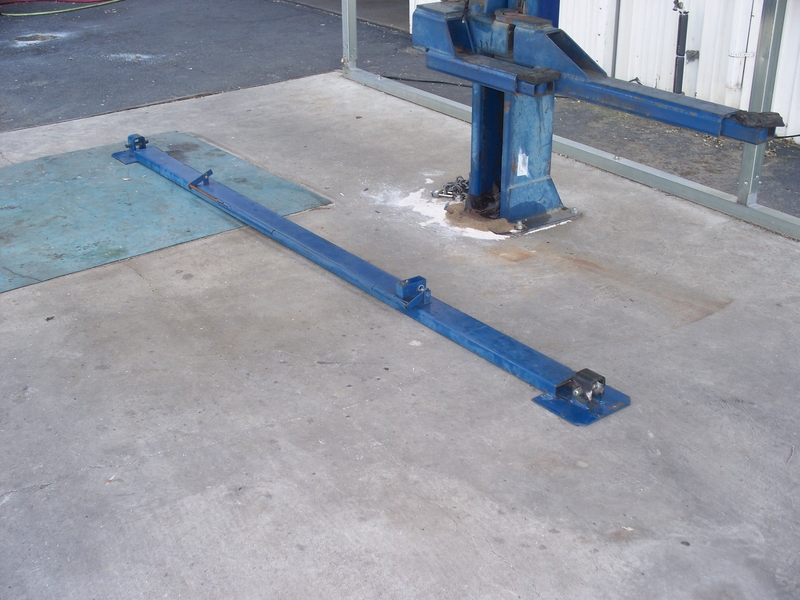 This tow truck is used to haul junker cars and sometimes more than one so they needed something strong and durable. I used a piece of 10″ standard pipe for the radius and 3/8″ plate for the flat pieces. I think the bolts that hold this to the wench mount will fail before the guards do. 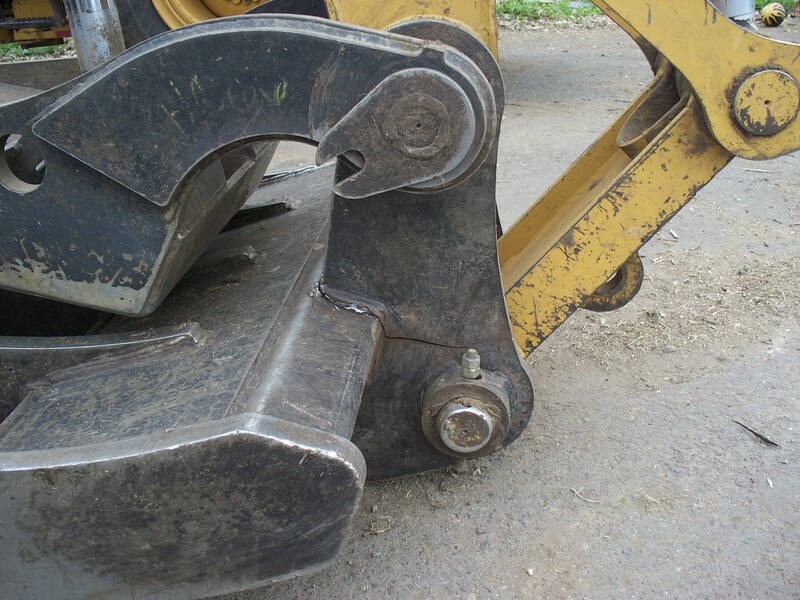 This grapple is used on an excavator at a transfer station. Vito Trucking out of Modesto uses it to load a green waste grinder. They called because it was cracked. It was critical that their excavator be up and running soon. Two of us were able to work on it and it took about 12 man hours to complete. We were able to get them back on track and they were using the excavator that evening. I gouged out the crack and in so doing the two pieces of the pivot pin boss seperated, they were only held together by about 1/4″ of material. It was very important that the two be put back together tightly so there were no gaps between the two pieces of material and so there would not be any added stress from the two arms being different lengths. This is a picture of the grapple from the inside and you can see quite extensive cracking. Cracks welded up from the inside. 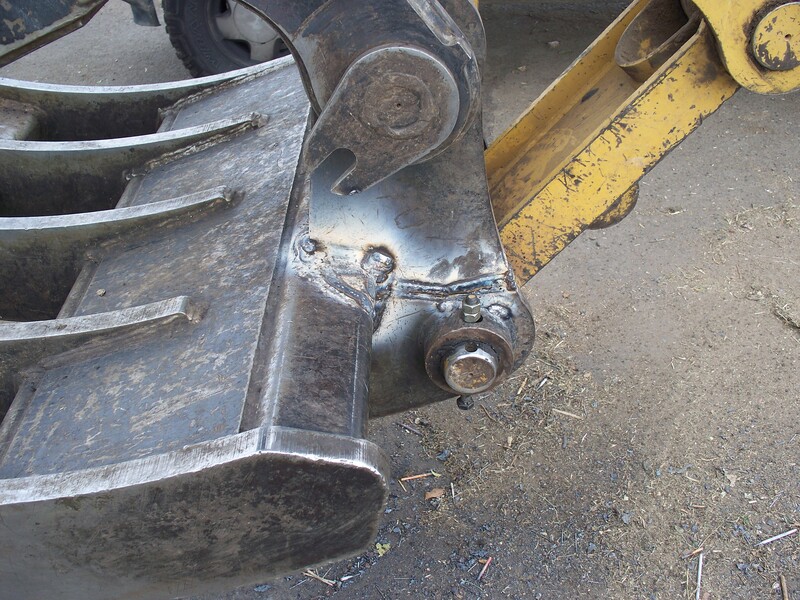 Pivot pin boss welded up. This is a couple pictures of a quick job I did for Mike at Downtown Auto. By the way if any of you work downtown near Richards and I-5 you should look him up. When I worked for Elmer’s in that area Mike would ride his bike to pick up the vehicle from our shop to do what ever maintenance then bring the vehicle back and ride his bike back to his shop. A really good service. Below – Pulleys turn on these two pins, its part of his auto lift, one of the pulleys got worn pretty badly and it started to wear the pin out. When I got there the pin was worn over 3/4 of the way thru. I cut the old pin out and welded a new one in, complete with the cotter pin holes. 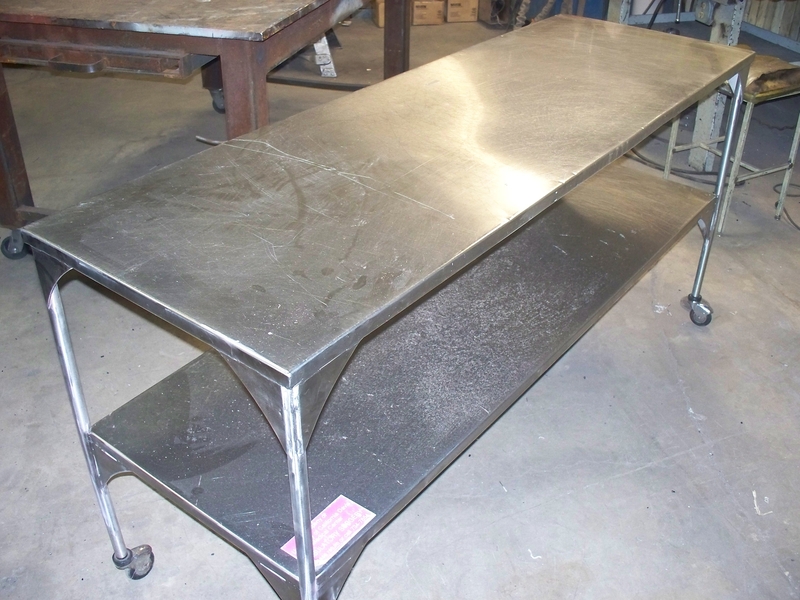 Jack at BMH Equipment, Inc., www.bmhequipment.com, asked that I look at this stainless steel table which is used in a hospital here in Sacramento, CA. One leg is completely broken off and another was nearly broken off. Someone had tried to fix it before but it did not hold. 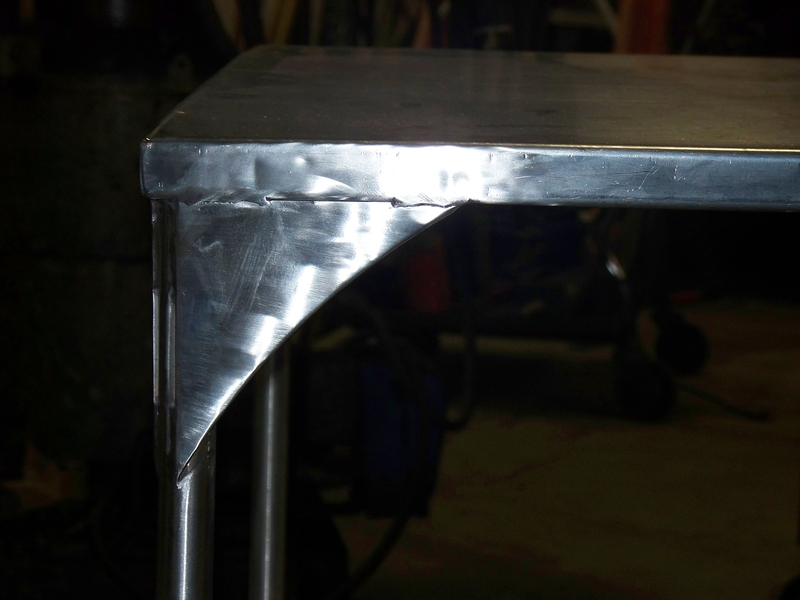 Given the apparent use of the table we agreed that the table needed more than just welding the leg back on. I welded Stainless steel gussets to each leg to strengthen that connection. Then blended the welds so the repair was asthetically pleasing.